BELLIN - Carte Des Lacs Du Canada Pour sevir a l'Histoire Generale des Voyages. BELLIN, J.N. - Carte Des Lacs Du Canada Pour sevir a l'Histoire Generale des Voyages. Carte Des Lacs Du Canada Pour sevir a l'Histoire Generale des Voyages. - BELLIN, J.N. 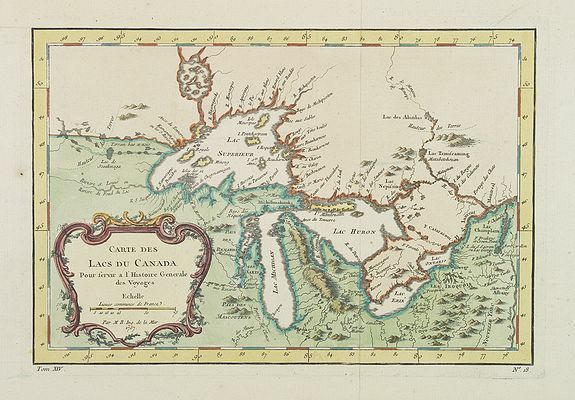 Title : Carte Des Lacs Du Canada Pour sevir a l'Histoire Generale des Voyages.. Size : 7.4 x 11.0 inches. / 18.8 x 28.0 cm. Description :Showing the all the Great Lakes in the traditional Bellin configuration. Bellin produced a substantial number of important separately issued maps, particularly reflecting continuing discoveries and political events in the Americas. Condition : In good condition. Wide margins.